We went on a super windy day when the weather pattern shifted (our luck). Captain Christian and his crew were fantastic, informative and accommodating. My husband wears glasses and there were prescription goggles on the ship. The captain was helpful finding the correct Rx. They had noodles or life jackets for those who need it. After we snorkled we tried to make it to the Na Pali coast. On our way we saw spinner dolphins and flying fish! It was pretty spectacular. We could not make it up to the coast due to the weather but we made it as far as we could. This was exciting because the waves were huge, I standing up towards the back of the boat and got soaked. They were informative about the possibility of getting wet and where to be to avoid. They also let us know where to stand in case of sea sickness. I started to get sea sick in the beginning (I might have super focused about possibly getting sick that I increased my symptoms) but I went immediately downstairs and headed to the back. The fresh air helped to calm my stomach and truly had a blast. I would definitely do this again but maybe in the early summer months. We experienced a lot of intense waves and swells throughout our trip. Mother nature always has her own agenda! 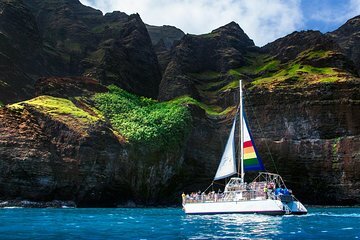 During our 1st vacation on the islands of Maui and Kaua‘i we had this tour on our must do list, and decided to book via Viator and Blue Dolphin Charters. We had to get up at 06.00hrs to arrive in time at their location at Port Allen for check in. After finishing this procedure we started our tour, on which we could see sea turtels and 2 different kinds of dolphins, swimming very close to our Katamaran. The tour was very rough, so we highly recommend to take medicines against motion sickness for those, who get seasick.But our captain Joe and his crew Dane and Rachel were very kind and gave assistance to everyone, if needed. We went with our boat under a waterfall, where you could get totally wet from the natural water.Then we went snorkeling, here you can use your own equipment or that from Blue Dolphin Charters. We saw abt 5 different fish, but no rays, turtels or dolphins. And the sight of the Napali Coast, where scenes for the movies Jurassic Park and King Kong ( with Jessica Lange) have been filmed, was breathtaking ! I am sure that you will find such a coastline nowhere else in the world !And the breakfest and lunch was good for everyone, with alcoholics or ice cold non alcoholic beverages.Therefore we were very satisfied with this trip and can only recommend to book with Viator and Blue Dolphin Charters ! This tour was soooo much fun! everyone on the crew was hilarious and made the tour a blast. We saw dolphins and whales. I just wish there was more than 1 snorkel spot because the one we went to wasn't really that great : but the rest of the tour made up for that. This was a great trip and a great way for us to round out our Kauai visit. The snorkeling was a lot of fun and the crew did an excellent job of keeping all of us fed and taken care of. I'm not sure if the waves are as rough, as they were in December, as they would be in other months. It took us a long time to get to the Napali coast and an even longer time to get back. Because of the choppy waves, multiple people were throwing up on the return trip. People just need to understand that this is a LONG trip roughly 7am-1:30pm. There were many more positives than negatives to this trip. We saw many sea turtles, porpoises, and whales. That was incredible. The Napali coast is breathtaking and a must see. Overall, we were very pleased with the trip. The captain was extremely knowledgeable and very entertaining. Would highly recommend but go in with eyes wide open. I wish we could have snorkeled in more than one spot. It was ok, but too short. Food was good, drinks plentiful. Got to see whales, Na Pali coast was very dark because of the weather. Amazing, don't miss!. Crew was great! The crew was amazing, the views were amazing, Dolphins played along side the boat and a whale breeched not once, but many times over in front of our eyes!!! A must do. Very safety minded too! Captain Joe and crew were awesome in every way.Lots of interesting info on the NaPali coast.Food and drinks were also above the norm.It was amazing and super fun.Next time would do the 7 hour island tour...do it !!! This is definitely a must excursion.... The Na Pali Coast is beautiful. The boat was amazing. The staff was great! Captain Chad, Yohave? my dive instructor and all the rest of the crew were fun yet professional! !